As this was the first-off Cam race for much of the crew, and one of our first at all together as the Lent W1 squad, there was an air of great excitement as we set off to Bedford on the Sunday morning. After remembering that we needed to bring blades with us, and managing to correctly catch the coach to Bedford, we made it in good time to assemble the boat and eat our usual pre-race banana fuel up. The weather was cool but sunny and we had a leisurely paddle up to the start line, which gave us a change to familiarise ourselves with the course and the various bridges and markers to guide us en-route. After getting tangled in a few reeds during marshalling, we did our rolling start and went off very solidly and at a good rate. We consistently maintained power throughout the course, focusing on technical resets and putting power down throughout the whole stroke. This meant we avoided dropping off too much in the second-half of the race, as has been a problem for us before. 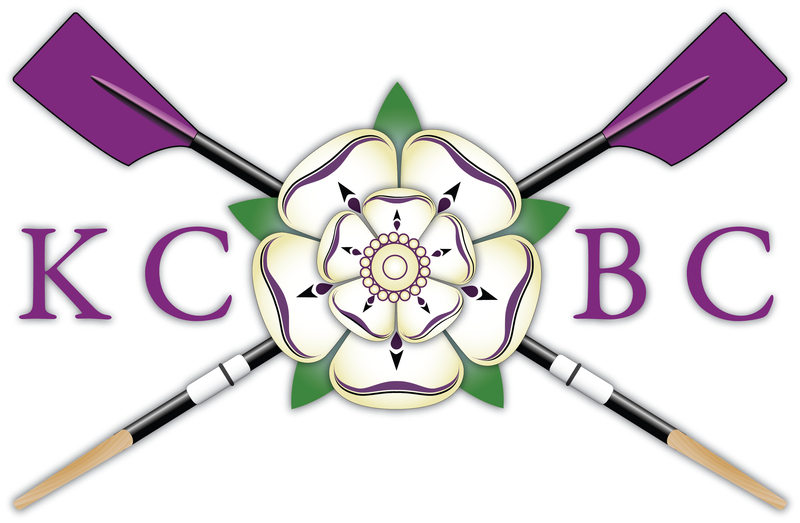 To cheers of several supportive W1 parents, we finished in a solid time of 8.05 which placed us in around the middle of our division and above some other Cambridge college W1 crews. For many of us in W1, WeHoRR was the first time we had ever rowed on the Tideway, which was both exciting and nerve-wracking. Our host boat club, Vesta, was near the finish so we had a semi-leisurely paddle to the start which allowed us all to become familiar with course. Marshalling was a slow process and which wasn’t helped by a freak five minute hailstorm which momentarily blinded the cox! But after a morning of cloud and the occasional shower when it was finally our turn to spin and race, the sun had come out. 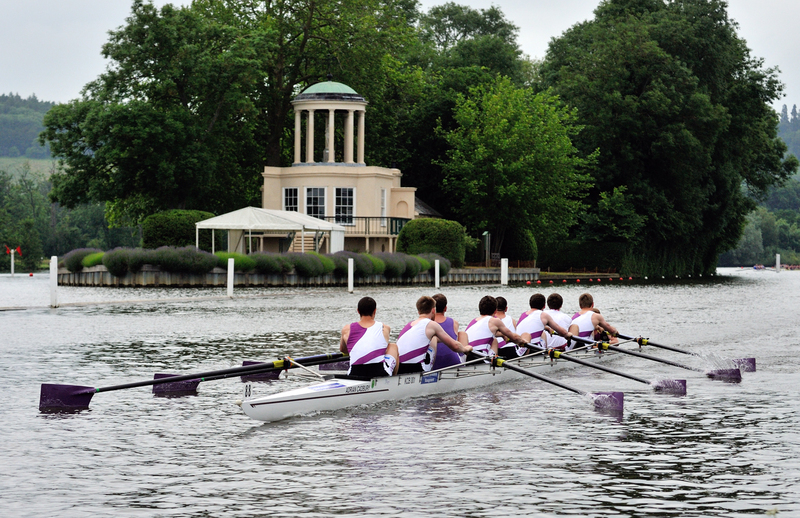 After a rolling start beneath Chiswick Bridge we crossed the start line at a maintainable 34 strokes/minute. We held off a Durham University crew until Barnes Bridge after which all crews had to struggle with the head wind. We still held strong, and managed to not let the rate drop below 31 for the entire race. Unfortunately just before we reached Chiswick Eyot, about 3km into the race the cox-box connections in the boat, which were already temperamental, completely stopped working. This meant, despite the cox’s best efforts of shouting, poor bow four had to row in near silence and with only a very rough idea of where the finish was. Despite this we still pulled through and maintained our rate at 31/32 finishing the race in 23:14 mins placing us 225/315 crews. 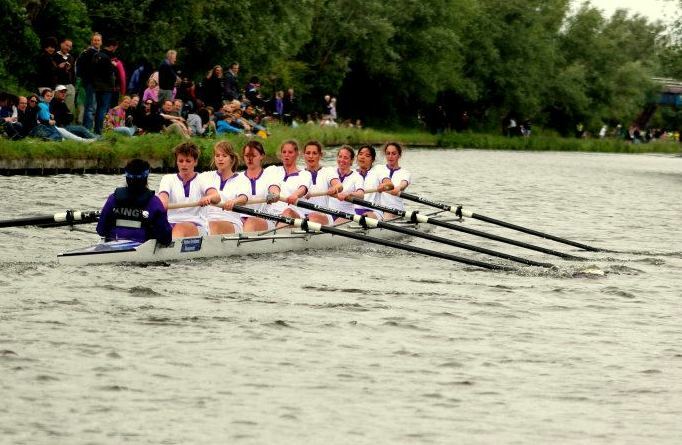 We had beaten W1’s time from last year at WeHoRR and also beaten some other Cambridge colleges including Magdalene W1, who we just missed out on catching on the third day of Lent Bumps. However the athletic events for W1 weren’t quite over yet…In order to catch the train to make it back in time for Women’s dinner that night we had to sprint between various tube platforms, all of us still in our matching purple kit, and only just managed to catch our train home at King’s Cross! In true W3/4 style (thanks to an impressively keen novice to seniors conversion rate), our race crew line up was an excited amalgamation of our 14-person strong pool of rowers in a previously untested format – and this was even before the addition of our definitely-not-stolen-from-Caius cox. Our first time rowing together as a crew combined with an uncontested unanimous admiration of the sheer stunning beauty of our newly purchased lycra (and a less sarcastic appreciation of rowing in a different boat to usual) to make us all hopeful that our first race as seniors would continue the trend of positive firsts. As we rowed down, a flock of black headed gulls kindly supported our optimism by graciously dropping another good omen onto Sally’s head. The practise starts rowing up to the start line clearly stood us in good stead, as the race got off to a good rolling start, with the boat picking up and nicely sat at a good rate – with us apparently possibly gaining on the men’s boat that set off before us (as relayed to us afterwards by a clearly biased bank party). We took the corners well, and a few power 10s helped pick up the speed as well as our temperature (with one rower’s dubious clothing choices leading to calls such as ‘Do it to keep stroke warm!’). By the second half of the race, maintaining body temperature was certainly no longer a problem, but speed was starting to drop. However, this was aided by a cheeky tactical strategy from the women’s captain of treating the race as two separate halves, and calling a new rolling start brought us back up to our former glory. With all heads up in the boat and everyone pushing hard, some beautiful pain faces started to emerge throughout the boat (particularly from 7). Reaching the railway bridge was the cue for the whole boat to give it everything they had, spurred on by some blatantly untruthful ‘last 10 strokes, girls!’, and we crossed the finish line almost without realising (to the accompaniment of satisfaction and exhaustion when we did). Rowing the boat back to the boathouse was comparatively uneventful, save for a wistful look from our cox to her old boat before realising where her loyalties truly lay. Overall, our final time looked promising for the getting on race, so it was a shame that we were unable to put a boat together for the latter race due to an unfortunate prioritisation of people’s degrees. A good start to W3’s senior racing, and one which will hopefully continue!